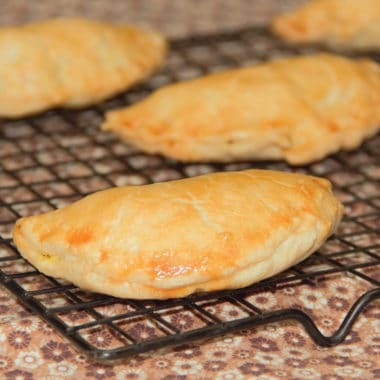 Pasties are a common item in bakeries across Australia. Their heritage goes back to Irish settlers, although they have changed a little over the years to their current variation. Pasties make a great lunch option and can be cooked and reheated while away, or eaten cold. This is what I consider a traditional vegetable mixture based on the region I grew up eating them. This recipe can be adapted to what you have on hand or to your preference. 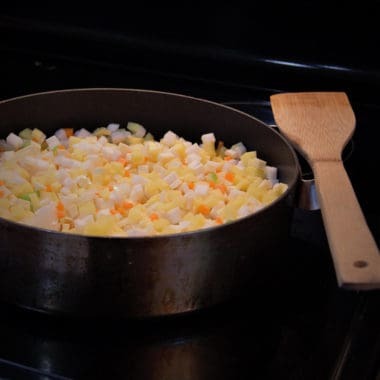 Finely dice to 1/4 inch (6mm) the onion, celery, potatoes, parsnip, turnip, and carrot. Melt the butter in a large skillet over medium-low heat. Add the diced vegetables and cook slowly, while stirring frequently, so they don’t stick to the bottom of the pan. None of the vegetables should be browned, just cooked through. When the vegetables have just lost their crunch, add the turmeric, white pepper, black pepper, and salt. Taste and adjust to preference remembering some of the flavor will be lost when wrapped in the pastry. Cover the skillet and leave to cool. Tip: Try to keep the pastry ingredients as cool as possible for the best quality result – this may mean keeping the bowl and flour in the cooler for a little bit before making. Tip: This isn’t like biscuits or scones where you are looking for a breadcrumb like consistency. For this dough the butter pieces may be as big as peas. Add the ice water then stir in with a butter knife until absorbed. It may look like it is still too dry, however if you squeeze a handful of the dough and it holds its shape, it is enough water. If it falls apart, add a little cold water at a time until it does hold together. Compress the dough into two balls then cover in plastic wrap. Place in the cooler in a location where they won’t get wet. After the dough has rested for one hour, remove and knead slightly until malleable only. On a floured bench, roll out the dough as thin as possible, but still able to be handled, about 2mm thick. Cut out rounds about 5 inches or 12cm. Tip: You can adjust the size of the round based on your preferred serving size. The larger the round the longer it will take to bake. Brush half the outside of the round with the egg. 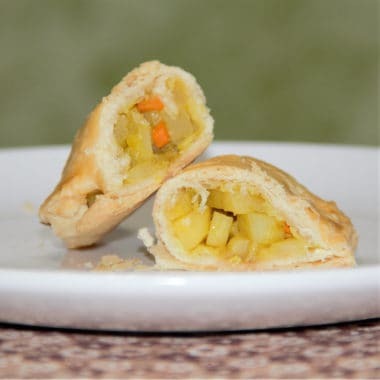 Place a serving of the vegetable mixture in the middle, leaving enough space to close and seal the pastry. Close the pastry and pinch along the curved edge to fully seal. Brush with the egg then place on a tray to bake. Place the filled tray into a camp oven preheated to 390 degrees F (200 degrees C) and bake for 20 minutes or until golden brown. 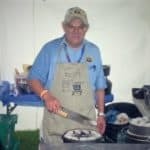 Let stand for 5 minutes before serving.